On June 2, Chinese Premier Wen Jiabao participated in the opening ceremony of the newly-established Chinese Culture Centre in Ulan Bator, on his two-day official visit to Mongolia. National flags of both China and Mongolia were waving along the National Palace road in the city centre, welcoming the first visit by a Chinese premier in 16 years and the first by Wen as premier. At proximate 9 o’clock, Chinese Premier Wen Jiabao arrived at the Central Mansion near National Palace. The 700-square-meter Chinese Culture Centre is located on the 7th floor of this building, delicately decorated with Chinese knots, calligraphy and paintings, all exact representatives of Chinese culture. At the opening ceremony, Zhao Shaohua, Vice Minister of China’s Culture Ministry, delivered a brief speech. 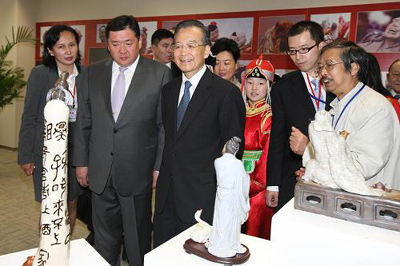 Then Premier Wen and Mongolia’s Vice Premier Minister Tsakhia Elbegdorj together unveiled the tablet of Chinese Culture Centre of Ulan Bator, signifying that the 9th Chinese Culture Centre had been established. With mutual trust being thusly deepened, China-Mongolia ties have developed further to a brand-new stage. In recent years, thanks to the more frequent and diverse communication between China and Mongolia, more and more Mongolian people have become interested in Chinese culture. 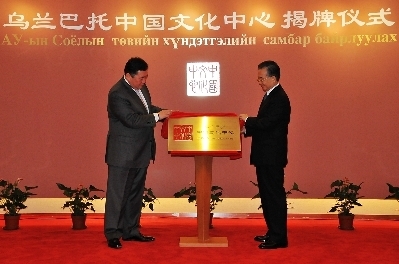 On May 1, 2010, China and Mongolia signed off on the establishment of culture centers in both countries. Within 30 days, the Chinese Culture Centre of Ulan Bator was built. In the afternoon of June 1, during the conversation with Tsakhia Elbegdorj, Premier Wen said China would offer 2000 opportunities under government scholarship to Mongolia and invite 300 young Mongolian people to visit China. The two Premiers also discussed the communication system between youths in China and Mongolia. Students from the NO.23 Middle School performed Peking Opera and presented some hada to Premier Wen. “You are the little ambassadors linking culture and friendship between China and Mongolia,” said Premier Wen to the students, “I believe that in the future many of you will be willing to further your studies in China. Do you want to go to Beijing? ” “Yes!” children answered in chorus. Premier Wen then took photos with all the students. Waling out of the Culture Centre, Premier Wen expressed his best wishes to the continuous success of the China-Mongolia cultural communication to Tsakhia Elbegdorj and they firmly held hands with each other.